east side bride: garden formal wedding attire? I will be the guest of my boyfriend to a June outdoor wedding held upstate in June. The invitation says the attire is garden formal with hats encouraged. I'm ok with the hat idea. In fact, I'm kinda excited. But the dress situation is freaking me out. I am "that girl" who only wears black. What the hell does a girl like me wear to a wedding advertising "lawn games" after the catholic ceremony?? I'm not opposed to floral or lace for a wedding, but I dont have the slightest idea where to begin. GARDEN FORMAL? WITH LAWN GAMES?? I think you should wear this Cynthia Vincent (so Stealing Beauty, right?) with a wrap to throw around your shoulders inside the church, and a wide brim hat by my friend Gladys Tamez. Many thanks to the catbird blog! Great, great suggestion ESB. 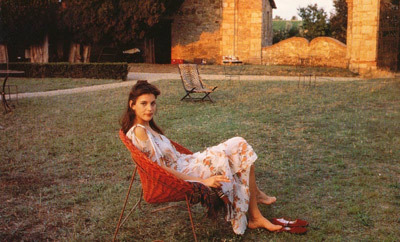 I was obsessed with Stealing Beauty as a middle school girl. nailed it. i want to go to a fancy garden party just so i could wear this look. Garden formal=casual semi-formal. It basically means, just because we're playing lawn games doesn't mean this isn't a wedding. So, I think that dress might be a wee fancy? i think shoulders are a-ok in a catholic church, especially in a dress that gorg. nailed it, esb. Shoulders are actually not okay in a Catholic Church. Definitely have a wrap or cardigan with that dress. It's weird. I've always heard that shoulders aren't okay in a Catholic church, but the last Catholic weddings I attended, the bride and all her attendants had bare shoulders. Soooooo....I don't really know what to make of that. Actually, this goes for the last TWO Catholic weddings I've attended. they've been alright in any church service/wedding my both roman & irish catholic extended family has drug us through. I think it varies a lot from church to church. Technically it is frowned upon, I would play it safe and have a cardigan/wrap on hand. However I think at weddings, where many of the guests are not Catholics, they are more lenient. They're not going to excommunicate you, but people will be tut-tutting behind your back. Besides, isn't it better to err on the side of being respectful? i dunno- weighing in as a catholic, i think our policy is act first, do some hail mary's later & you're GOOD! Are you going to this wedding? This dress is similar but reads a little more modern to me. Still wide brim hat, but you probably dont need a shawl if it's warm. I'm not sure if it's dressy enough, but probably a lot of people will be pretty confused about what to wear with that direction, so there will almost definitely be a variety of levels of dressed up-ness in the crowd. Love it. Except the price. Because this was going to be my (almost exact) question to esb, except I'm a broke grad student scraping together the money for the plane ticket - anyone have any budget thoughts? How about this ? But on second thought, I'm thinking it's too short. I also like this one which isn't floral per se, but still seems like it would work. Thanks! Great choices - love the second one. I NEED THAT HAT ESB. for my trip to mexico next week. can you make it happen? YOU can make it happen. Call her. 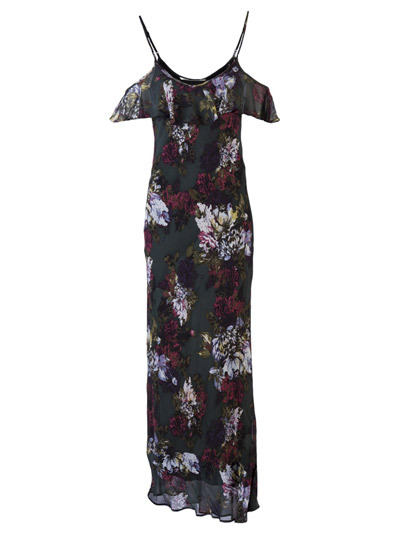 This is pretty much the dress code for all English weddings at the moment - which means the UK high street is usually awash with affordable girly, florally, floaty, summery, boho-y crap. Try Warehouse, Oasis or ASOS, Martha? They all deliver to the US. This little Band of Outsiders number (on clearance!) could be cute, with a fun hat, and some cheerful shoes. Too morbid? This one is ON THE MONEY. Stupid question... How do you hyperlink? I know how to do it in Word and Gmail, but can't seem to do it here. I want to post something but don't want it to be a giant comment! Help anyone?